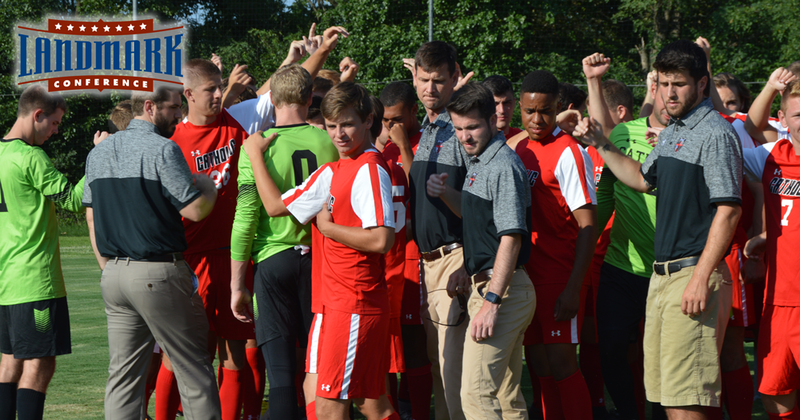 For the Catholic University men’s soccer program, the 2016 season was not particularly memorable. The Cardinals fell out of the top four of the Landmark Conference standings and failed to qualify for the conference tournament for the first time since 2007. After finishing with a 6-11-1 overall record with just one win in Landmark play, the team knows there is room for improvement. “It was definitely a frustrating campaign for us,” head coach Travis Beauchamp said. It was indeed a disconcerting fall for the club, as Catholic dropped its final four matches of the year. Coach Beauchamp believes his team has the potential to bounce back in this upcoming 2017 season. Unlike famous slugger Mark McGwire, CUA’s head coach is willing to talk about the past and reflect to see how the club can improve. As for the key to being more competitive in each game? It all starts with defense, says Beauchamp. He hopes the players from the incoming class of 2021 can contribute to this cause with the help of some veteran leadership. Catholic will welcome 9 incoming freshmen and one transfer (class of 2019) that will look to make an impact. Three of which are listed as defenders, including the first cousin of senior captain Matt Holtschneider, Nick Battaglia. Beauchamp and his staff feel good about the talent coming in, and notes that after a season like they had, everyone will get a chance to prove themselves. “It’ll be an exciting preseason to see who steps up; there are just a few positions that we just feel like we can circle a name and move on to the next one. So it’ll be pretty competitive,” Beauchamp said. The captain Holtschneider is excited about this competition. Another challenge that the squad will look to overcome is the all-important task of goal scoring. Catholic found the back of the net just 19 times in 18 matches last season, a statistic that places them in the bottom of the conference along with Susquehanna University when it comes to goals. The team usually possessed the ball well, but at times lacked coherency in the final third to finish with goals. Holtschneider emphasized the importance of all eleven players on the pitch in contributing to putting the ball in the back of the net. With an emphasis on defense, Catholic might not need to rely on a primary goal-scoring forward, but having one sure would not hurt. Junior midfielder/forward Brian Galfond and senior defender Pat Mogan led the team last season with three goals a piece. The lone listed striker out of the incoming class is Daniel Bello, hailing from Buenos Aires, Argentina. Catholic’s veteran goalkeeper, graduate student Zachery Tashjy, will continue to lead the team with his play and presence in goal. He will look for help from a collective defensive effort featuring defenders Battaglia, Mitch Ford, Tim Figueroa, and Corbin Brailsford, among others. The Cardinals have been predicted to finish 4th in the Landmark Conference in a preseason coaches’ poll. They will likely face their biggest challenges in familiar foes like Elizabethtown, Scranton, and Drew. When a traditionally successful program takes a step back one season, the hope is that the year was more of a fluke and a return to the mean will come next. Heightened expectations are a consequence of being a perennial conference contender, and Beauchamp has reason to be optimistic about the challenge. “I think because of our reputation and the nature of the university we seem to draw really good kids, and really good students. So I don’t think this is a trend, but more of an exception,” Beauchamp said. There is no doubting Holtschneider is fired up about the upcoming season, and he hopes the entire squad will share in his intensity.